Examples in letter-writing manuals: real or fiction? After our group discussion of last Tuesday, I became interested to know whether or not the exemplary letters in the discussed letter-writing manuals such as The Complete Letter Writer were real or not. Even though my primary impression was that these exemplary letters might be considered as genuine letters, further investigation has indicated that these exemplary letters show very little similarities to authentic historical letters of the same time. Susan Whyman states in her book named The Pen and The People: English Letter Writers 1660-1800, that “one way to approach this problem is to compare the models suggested for use in manuals with actual letters. In truth, few letters were found in family archives that resembled those in published guides. Nor were there references to using manuals in real letters, though examples sometimes appear in personal book lists” (2009, p. 28). Although the exemplary letters of letter-writing manuals provide us with a primary realistic image, it can be concluded from the lack of factual and historical data that these letters are not authentic historical documents written during real correspondences, instead they can be considered as fictional products of various authors. Whyman, Susan (2009). 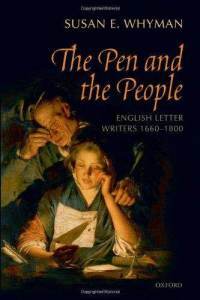 The Pen and the People: English Letter Writers, 1660-1800. Oxford: Oxford University Press. This entry was posted in letter writing and tagged Letter writing manuals. Bookmark the permalink.